After an accident causes Captain Sisko to disappear, Jake is left behind to grapple with the emotional aftermath. Matters are complicated by the Captain's increasingly sporadic reappearances, the last of which occurs when Jake is an old man near death. Look, dad, I finally stopped wearing such awful clothes! Matthew: This episode has a very strong emotional hook. It mines the best established and most believable human relationship in the series. It certainly tugs at heartstrings, but not I think in a cheap or manipulative way. It shows a deep and abiding love between a father and son that persists through several decades, and it shows the positive and negative effects of such a love. This level of depth and emotion is a rarity in most television, I think. The story also has the happy side effect of making Jake Sisko a worthwhile character to watch. Although it focuses on his one previously established trait (he loves his dad), it gives him a history and a personality that had kind of been missing in prior scripts. Kevin: I think one of the things I like the most about how Jake's character is used here is that his motivation and conflict come from a very real, identifiable source, grief at the loss of a parent. Unlike Roddenberry's frankly bizarre edict in "The Bonding" that children would not grieve their parents in The Future, we see something familiar in Jake's reactions. It actually draws me in more to the Star Trek world to see that some things don't change for humanity, regardless of the setting. I think the show also chose the exact right tone for the grief. It was not torturous speeches or grandiose displays of grief, but just the persistent sense of numbness that comes with this kind of loss. Matthew: In the balance, this story essentially functions in the same sci-fi way as other alternate history shows. It's not terribly unlike "Future Imperfect" or "All Good Things..." Each episode has different themes and different mechanisms for creating said future. But all of them are united by spinning an interesting extrapolation on what we've seen in the show thus far. I did have a few questions about this future, such as: who is the replacement captain? Once it was established that Sisko was reappearing, wouldn't this have religious implications on Bajor? 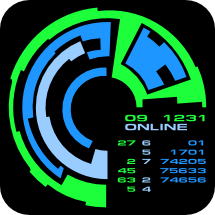 Did the Dominion just do nothing for 50 years, or did they fail to mention the war? Nonetheless, the future forecasting was still relatively interesting. Kevin: I was happy overall with the exposition. The current Klingon threat we had seen in the last episode drove Jake from the station, and I think the viewer can reasonably infer enough based on what the characters said to not feel like anything was too out of nowhere. I think had the characters fleshed out too much of the history, it would have felt like inorganic exposition. I liked the more personal focus for the future stories. Nog is a Captain, Bashir has children, etc. That's the more fun part of future stories anyway. I also liked the marriage and divorce to Karenna. The recital of support turning to distance turning to divorce was really sad. And while we're on character stories, I have to say that the framing sequence was a master stroke. It organically explains the narrative, and I ended up really caring about Rachel as well. She and Jake had a nice rapport. The writers were inspired by the real life interview of JD Salinger done by a high school student who showed up at his door. Done badly, it could have been flimsy, but the script made Rachel seem like a real person. I remember feeling a twinge at the end of the episode that this woman no longer existed. Lastly, I really liked Kira's scene with Jake in the airlock. The characters have never really interacted, so it's a credit that the scene had such quiet gravity. Matthew: Why did Jake have to die? The sci-fi science was a little foggy. I get that there had to be some mechanism for Sisko to follow Jake around through time and space. But Jake's logic near the end seems quite shaky. He says that "if my motion through time stops, he'll be lost forever." Just how does one's motion through time stop? Death? Um, yeah, the matter that is you keeps on going through time, whether you're alive or dead. Even if you were cremated, the atoms that were you would presumably still contain this subspace attachment. It seems to me like Sisko would show up at Jake's grave, not be lost forever. On the other hand, if the matter in our bodies is refreshed over time, wouldn't the connection dissipate as Jake's body replaces its cells and atoms? Hmm. The only other explanation would be that their minds are somehow tied, but that is nowhere even close to explicit, and is far too mystical for my tastes. So, the mechanics of "cutting him loose" were pretty murky, and ended up creating a galactic reset, story-wise. But then, why does Sisko remember what happened? His uniform is no longer dirty when he reappears, as it had been throughout the episode, which leads a viewer to believe that the accident has been prevented before it occurred, thus closing off that time-like loop of story forever. Doesn't that mean that Sisko never was really witness to the potential future? Or are there two Siskos now? Yeesh. Look, I'm not saying it didn't allow for some great scenes. I'm just saying it didn't make a ton of sense if you thought about it too hard. Kevin: I agree overall with both the logic problems and the fact that they don't derail the emotional story. I think a little tweaking could have found a way to justify Jake's death. I almost hate to say it, but I would almost like to have seen a solution that left Tony Todd as middle aged or older Jake instead of or in addition to young Jake. That would have been interesting. I would have liked a little more focused on Sisko's grief. 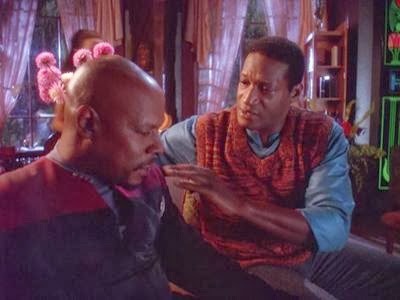 Even knowing he would live and Jake would have his life to live over, would Sisko really be okay with his son's suicide? It's a powerful scene. Maybe if Sisko had stayed for longer visits, they could have discussed the plan first. That could have been really fun. Matthew: This episode is extremely heavy on a guest actor. Now, it happens to be Tony Todd, who has never been anything short of excellent. This is his best Trek role, quite easily. The way he portrays Jake Sisko's unrelenting grief is very affecting. We haven't been Cirroc Lofton's biggest fans, and yes, he is still a tad wooden here, but whenever he has to portray his attachment to his father, he delivers, too. It sells the show to the point that plot issues fade a bit. That said, their voices and their physical presences just don't match. What happened to Jake's Vocal cords between ages 25 and 35? Did he have a voicebox transplant? Yeah, I know, suspension of disbelief and all that. But I just want to say it was noticeable. Kevin: I really hope my voice drops an octave when I hit 40. That will be neat. Todd's performance alone justified the praise the episode gets. When Rachel asks if time healed his wounds and he quietly responds, "No," I feel like someone sucked the air out of the room. Especially in comparison to his more bombastic Kurn, he handled these quiet moments masterfully. Matthew: Avery Brooks delivers a wonderful, restrained performance. He shows fascination but also a strange sense of grief, too, at seeing his son so damaged by his disappearance. It's really well done, and it makes me wish that his scenes had lasted longer. Maybe he could have stayed for a day at a time, not just minutes. Kevin: Avery Brooks has said in several interviews that part of what appealed to him about the role was the depiction of a father and son of color on television, something not done all that often. That must have informed his performance, because it really shines through in every scene his primary concern is his son's well-being, even at the cost of his own. The nature of his disappearance never swallows the conversation about Jake living a full life. His grief at the end of the episode is palpable and moving. Matthew: Rachel Robinson, daughter of Garak actor Andrew Robinson, definitely brought her A game, radiating youthful enthusiasm and empathy. She brought just the right mix of innocence and moxie to the role. The other main cast standout for me was Nana Visitor in her scenes with Jake. Kevin: Agreed on both counts. I guess acting talent runs in the Robinson family. My only acting regret is that for all the mentions of Joseph Sisko and his restaurant, we never got to see him. I know they hadn't cast Brock Peters as the character yet, but I can retroactively dream. Matthew: Rarely does episode score music make itself noticeable in Trek. It's there, it's good, but it is background. Here though we get a beautiful intro music cue, which has been collected on several Star Trek albums, and for good reason. It's really outstanding. Kevin: I know my agreement gets repetitious, but it's hard to overpraise the music work in this episode. Matthew: The set of the home was good, very rich and detailed. Old Jake's outfits were... good. I guess his wife bought him all new clothes. The glow in the dark book covers looked dumb, I'm sorry to say. Who would bind a paper book in leather just to slap a crappy "futuristic" cover on it? Kevin: I loved the house. Little touches like Sisko's baseball on his desk were nice. I liked a lot of the little touches in the future scenes. The clothes were good all around. They looked real and comfortable. The lighting work in this episode was great to. Both night and day and the transition looked gorgeous in the house and gave the sense of the time going by for Jake. Matthew: I did not love the makeup on Tony Todd, nor did I like the age makeup on the main cast during the far future scenes. It all just looked like silly putty. One optical effect was a big standout, the great interior rear window optical of Jake in the shuttle leaving DS9. Kevin: The All Good Things... uniforms were a nice touch, though I agree on the make-up. Dax looks way to puffy. I liked Todd's makeup more than you did. I also liked having Bashir's pants hiked up to his armpits. It was slightly silly and a more effective indicator of his age than the makeup. Matthew: This is not a slam dunk 5 for me. I think there are enough questions and slight missteps that a 4 would be reasonable. But the emotional punch can't be denied. The tale of a life-long love between father and son just plain works. This ends up being upper decile Trek as a result, despite some shaky sci-fi logic. So I will call this a "low 5" from me. Kevin: This is a slam dunk 5 for me for a total of 10. Tony Todd reciting his lines alone on a bare stage would get a 5 from me. The world of Star Trek provided the platform for the story to happen, but the emotional impact is relateable and almost worse for the fact that nothing in the future makes this problem easier. The character work for Jake and a truly moving emotional payoff definitely put this in the top ten percent. I would make the argument that this episode belongs in the top 10 Trek episodes of all time, based on the emotional punch it delivers, the tremendous acting provided by all the actors involved, and just the gut punch of a story itself. I really like this episode too but like you guys the make up in the future really bothered me. Shouldn't Dax and Bashir be very long in the tooth for the next worm hole incursion.I had a hard time believing them still being in star fleet. Also If nog has already become captain, I have a hard time believing that Dax would not have at one point become Captain ahead of Nog. I like it quite a bit when characters are shown not to get promotions simply as a matter of course. It makes the organization feel like a real place, where people can get stuck in career ruts (e.g. Picard in Tapestry, Riker in general), or simply have different career goals (different tracks like command, science, Troi not taking the commander test)..
Yeah, it doesn't bother me that a science division person doesn't necessarily climb higher in rank. See while I agree in theory that its nice that people like a Barclay don't all just get promoted. I personally always thought that Jadiza was a bit of a star. Yes I admit I had a major crush on Dax. I guess I think about our current military and I would assume that the chief of nuclear reactors in the U.S. is a Captain or probably even an Admiral who was once a chief engineer. I get the doctor not being a Captain but Dax is just wrong.